A pensioner has been told she must stop tending a public flower bed unless she agrees to wear a fluorescent jacket, put up warning signs and use a lookout. 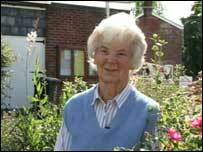 June Turnbull, 79, of Urchfront near Devizes, has nurtured the blooms on the plot for six years. But now she is being told to obey health and safety rules after being spotted by a county council official. Mrs Turnbull said: "I was very angry, I mean it seems so petty bothering with what I do here. There's just no point." Peter Hanson, divisional highways manager at Wiltshire County Council, said: "We are always happy to work with individuals and organisations that are willing to help improve the appearance of local roads through improvements such as flower beds. "However, to ensure this type of work is done safely they need to seek permission from us to enable us to check there are no local safety issues, such as underground wires or pipes. "We also require that people undertaking this type of work follow the same safety procedures as our own staff to ensure they are not put at risk. " Urchfont Parish Council has recently applied for a licence and has had a meeting with the county council. 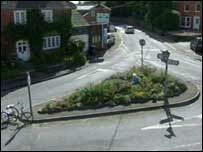 "We need to get a licence from the Highways Authority to enable work on this bed to be done, people must wear a fluorescent jacket, have warning signs and have two people working there," Peter Newell, chairman of Urchfont Parish Council, told BBC News. A defiant Mrs Turnbull said it was "health and safety gone mad" and has vowed to continue gardening despite the warning that she would be banned. She insisted: "I love doing it. I want to make it as pretty as I possibly can. I will continue working on the flower bed."